Vegetable gardening for beginners isn't the title of the latest gardening best seller, though I'm sure someone somewhere has written a book with that title, but we all have to start somewhere and this page is dedicated to those just starting to grow there own veg. And don't worry, many vegetables are actually easier to cultivate than flowers. Basically, vegetables are sun lovers. They need at least six hours of sunlight a day, so select a garden spot that does not get a lot of shade. Some leafy vegetables like lettuce, spinach and endive like some shade during the day, but vegetables that must develop roots, like carrots, beets, tomatoes, peppers, squash and radishes need a lot of sunlight. Another good point for vegetable gardening for beginners is to be wary of low areas where water tends to stand after a rain. You need good, loamy soil that is well drained. If your garden site does not have ideal soil, you can improve it with good soil management and you can get good advice at your local garden centre that can assist you with specific information on your area. A flat garden is the easiest to tend, but if you must plant on a slope, place your rows along the slope, not up and down. This will prevent erosion and provide the plants with the maximum amount of rainwater. A good mulch will also help catch the water and prevent erosion. If the hill is steeply sloped, you will have to terrace it with stones or wood, which can become a nice design feature. Another rule of vegetable gardening for beginners is to have your garden near a water supply, even if it is just a garden hose. 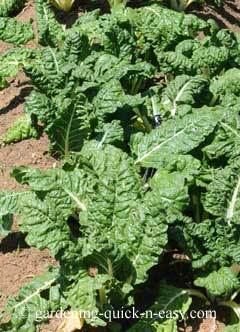 Vegetables are ninety percent water, so soil moisture is vital if your crops are going to develop. A heavy mulch will help your garden soil stay moist, but the crops will still need about an inch of water a week, either from the rain or from irrigation. A final tip. If you live on a large property or in a rural area, try to have the garden as close to the house as possible. There are several reasons for this. The nearer the garden is to the house, the easier it will be to tend. It also means you won't have far to carry your crops back to the house. It will be convenient for you to step outside and fetch fresh vegetables even while you're preparing a meal. Note: If you have some great vegetable gardening tips to share, or want to show off your vegetable garden design or send photos of your bumper vegetable crops, please Contact Us - we'd love to add it to our pages.